The holidays are here and anyone who likes to craft know that this truly is the most wonderful time of year. Baking, quilting, paper crafting, sewing, and woodworking are in full swing during the holiday season. Most crafters know how easy it is to drift into the craft “zone” which can lead to cramped fingers, aching shoulders, and a throbbing back. For anyone else these can be a minor inconveniences, but for those with arthritis this can lead to major issues. Don’t let arthritis take away your love for creating, implement some ideas to make crafting easier, and keep that creative spark alive. Keep reading for seven ways to keep crafting with arthritis. There are so many tools on the market made to make life easier for arthritis sufferers, so take advantage! There are many different gadgets available for those who spend their time in the kitchen, including electronic can openers, one handed cutting boards, and standing mixers. If you are more of a fabric connoisseur, look into some ergonomically correct scissors with sculpted handles. For woodworkers, tools are a matter of preference, but if you are able to utilize power tools over hand tools, be sure to give your body a break and let the tools do the work. Whatever your craft, be sure to hone your blades to put less pressure on your joints and help reduce grip pain. Ensure you are using the right sized tool that works for you and your body. Create a comfortable work space is arthritis-friendly. Ensure your work surface is the right height. Utilize comfortable, adjustable, and ergonomic seating. If you stand a lot, invest in quality, anti-fatigue mats that offer support and comfort. Create a pegboard to hang your hand tools to help minimize bending. Spend a little time making it fun by decorating a craft cave that suits your style and your personality. Organize all your materials efficiently to make your crafting life easier. Use clear bins so you can see what’s inside. Label any bins or storage drawers and keep the things you use the most in easy reach. Ensure storage containers are lightweight so they are easy to move if the needs arises. If you stay organized, you can spend more time actually creating instead of searching for you what need and feeling aches and pains while you look. Work smarter, not harder. Try to minimize repetitive motions as they can be very taxing on the joints. Let the weight of your body do the work; if you are cutting something, stand so your body weight adds momentum. Ensure you are using the correct technique. Watch tutorials and thoroughly read tool instructions to make sure you know the proper method of use, and then adapt that to fit your needs. There is an amazing feeling of satisfaction when looking at a creation and knowing you made it from scratch. However, when it comes to managing arthritis, shortcuts can be lifesavers. So don’t hesitate to buy that premade crust, use the precut card stock, or purchase the base of a quilt and add embellishments to make it your own. Know when it’s time to make a change. Sometimes we simply cannot do the things we once loved. However, that doesn’t mean it’s time to give up completely. If sewing is too hard on those fingers and wrists, look into knitting. If woodworking isn’t a possibility anymore, research painting or pottery. While it is hard to give something up, it’s important to always have that creative outlet. While you may have to let something go, find something else that will spark that fire. Listening to your body is key when crafting. If you are in pain, take a break and rest, or do something else and come back to it later. It’s important to ensure you are giving yourself enough time for rest and recuperation time between activities. Overdoing it can result in flare-ups or can have you feeling miserable, ensuring much less crafting in your future. There are many positives to engaging in arts and crafts including physical, mental, and social benefits. Creating gives people a sense of accomplishment and a purpose. It forces people to interact with others and encourages personal growth. Sometimes your body may be telling you no, but it is crucial to find ways to keep crafting and creating. Don’t let arthritis force you to give up on the things you love. 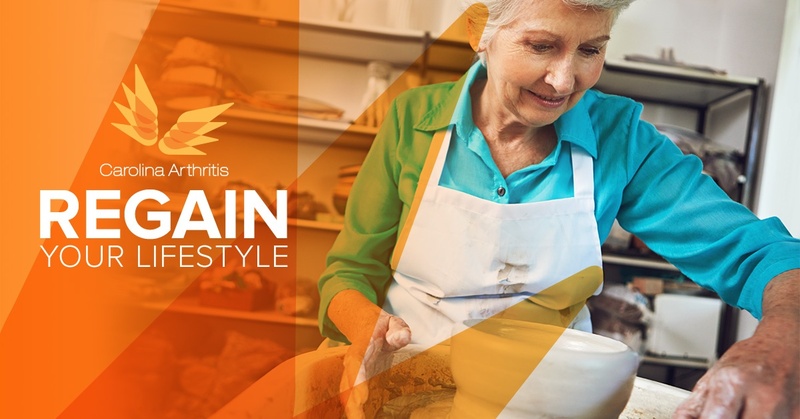 If you need more ideas for crafting and coping with arthritis, call Carolina Arthritis today!